Journal : Dublin journal of medical science. Vol. lv. Dublin : Fannin and Co., 1873. Description : [1 l.] pl., -507 p. ; ill.: 1 photo. ; 21 cm. Photograph : 1 mounted photograph — image composite. Subject : Skin — Ichthyosis. Author caption: By E. D. Mapother, Surgeon to St. Vincent's Hospital; Professor Royal College of Surgeons; late Examiner in Surgery, Queen's University. Revised: Mapother (1889), Papers on Dermatology. London: Churchill (p. 30-35). Elected President, Royal College of Surgeons in Ireland, 1879. The faithful photographs by Mr. Lesage, which were published in the Dublin Medical Journal for June 1873, exhibited most of the features I have detailed. As they are untouched photographs they must show " the truth, the whole truth, and nothing but the truth," which cannot be said of many representations of skin diseases which have been issued. While the patient was in St. Vincent's Hospital she was seen by many members of the profession. Dr. Davys of Swords informs me she died of acute bronchitis in 1878, and that for many years previously she had kept the skin trouble in check by the inunction of cod-liver oil and glycerin. — Mapother, Papers on Dermatology, page 35. 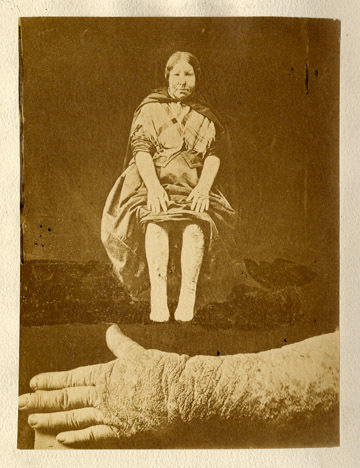 Photograph is a composite representation of the clinical subject, a seated 42 year-old female who has hiked her skirt and sleeves to expose her limbs to the camera. Below this image is joined a close-up of the subject's hand and forearm, detailing her skin affliction.